I really need to and want to declutter. I kind of got of track the past week or so but am determined to start back up again by going through one drawer or cabinet a day. I want to reap some monetary benefit from all this stuff and have a yard/garage sale with but that takes a lot of time (and help). Do you find it better to donate or hold a sale? My goal is to finish part of the basement for a proper craft room where I can organize all the many materials I use and to also have a place for my kids and grandkids to be crafty. I decided to knit different sweater/shell/tank out of the Cascade Ultra Pima. 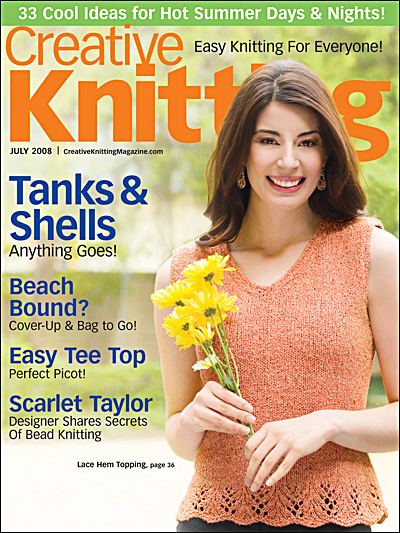 It’s from Creative Knitting magazine July 2008 issue and it’s featured on the cover. The yarn is supposed to be a worsted weight (same problem I have with the Eileen shell from No Sheep for You) but since this isn’t supposed to be knitted as tight as the Eileen, I decided I can use a knitting gauge/stitch converter and still make it fit. What a FABULOUS tool this converter is! As it turns out this converted to the exact stitch count for a larger size so I can knit this without having to blindly convert the shaping ! This entry was posted in cleaning, declutter, gauge, knit, knitting, knitting pattern, pattern, yarn and tagged cleaning, declutter, gauge, knit, knitting, Lace Hem Topping, pattern, stitch converter, sweater, yarn by Patti_is_knittinginflashes. Bookmark the permalink.